Even though I had never before tasted an old fashioned pudding cake, I immediately bookmarked this recipe when it was featured on her blog back in March. Ms. Reichl has a lovely way with words, and the way she described this classic dessert as “part cake, part souffle, a little bit pudding” sounded absolutely irresistible to me. With only six ingredients on the docket and little prep required, this Lemon Pudding Cake comes together in a relative snap. The only really daunting part is waiting the full 45 minutes for it to bake up nice and golden. I made the cake as the grand finale to our recent anniversary dinner, and The Astronomer and I could not have been more satisfied with the results. 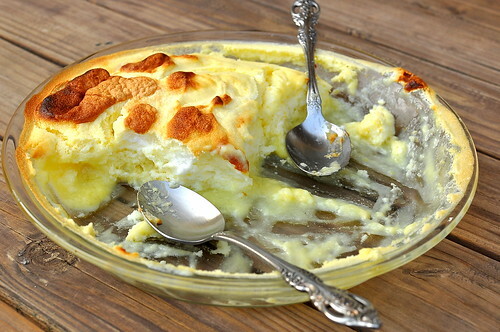 The whipped egg whites created a souffle-like effect, while the egg yolks anchored everything in a tangy pool of lemon curd. In between the two strata was an ever-so-light layer of cake. We dug in with two spoons just as soon as it came out of the oven. It may have singed our tongues and the roofs of our mouths a little, but man, it was worth it. Pudding cake is overdue for a comeback. 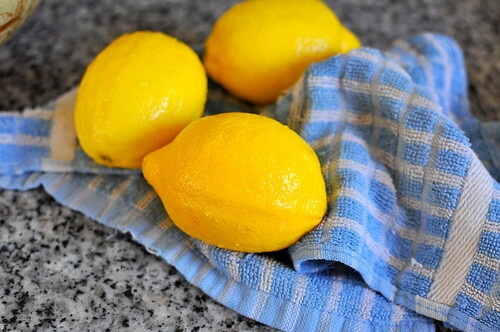 Grate the zest from 3 lemons, then squeeze the juice. You should have about 1/2 cup. Separate 3 large eggs. 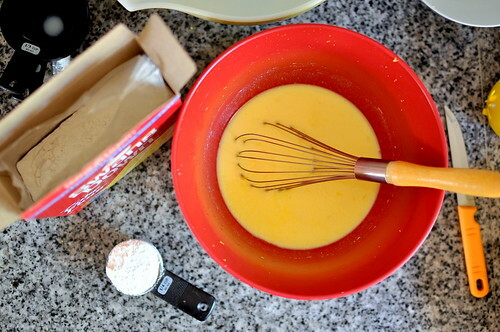 Add the lemon juice and zest to the yolks, then whisk in 1 1/3 cup of milk. Slowly add 1/2 cup of sugar, a dash of salt, and 1/4 cup of flour. Beat the whites until they hold soft peaks. 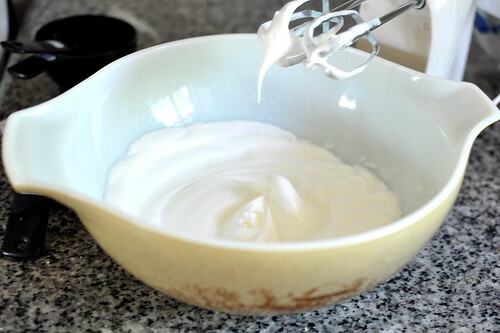 Whisk in the remaining 1/4 cup of sugar, and beat until the whites turn sleekly glossy and hold a stiff peak when you pull the mixer from the bowl. 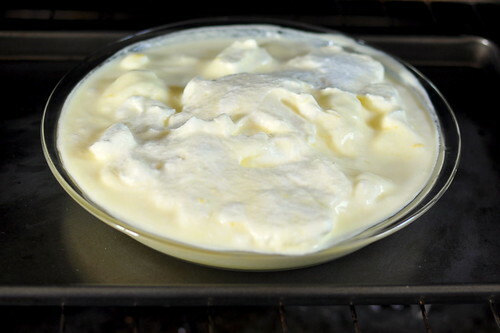 Whisk a quarter of the whites into the yolk mixture, then gently fold in the rest of the whites. Transfer the mixture to a glass pie plate. Boil some water in a kettle. You’re going to bake this in a water bath, so you’ll want a large square or rectangular baking dish that is large enough to hold your pie plate and leave a bit of room around it. Set the empty pan in the oven, put the pudding cake in the center, and carefully pour boiling water all around it, about halfway up, being careful not to splash any into the cake itself. 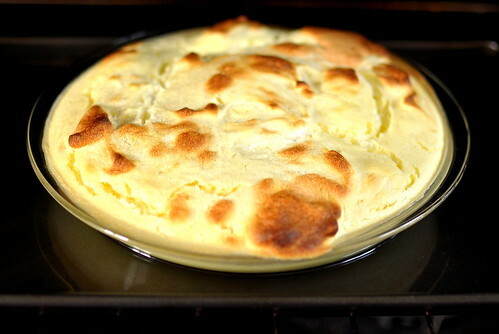 Bake for about 45 minutes, until it is puffed and golden. Cover loosely with aluminum foil if the top browns too quickly. Remove from the water bath and cool on a rack. Yum! The first time I ever had pudding cake was when I made a hot toddy cake (I think from Gourmet). Lemon boozy deliciousness. Wow you guys did good trying to eat that in 1 sitting! This looks like such a stellar pudding-cake-souffle. I am bookmarking for when I move to So Cal and have readily available lemons. I do what you say, Ruth + Cathy. Happy anny, too. wow that’s a lot of eating you guys. good job! Bags – Vern and I are big eaters, but this didn’t take much effort because it’s so light and fluffy! It was like eating lemon-flavored clouds. Goes down so easy! This looks great! And I agree, what Ruth Reichl says goes.